With the right leather jacket, you can create endless different looks: whether you would like to create a casual outfit with a scarf and jeans or a fancy look with a midi skirt and a blouse, a leather jacket is an absolute must-have in every wardrobe! Get inspired by our favorite 30 street style leather jacket outfits and tips on how to style your jacket. 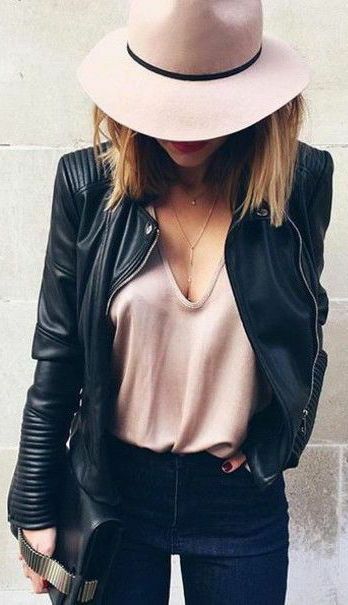 Because of its versatility, there are basically no rules when it comes to rocking leather jackets. 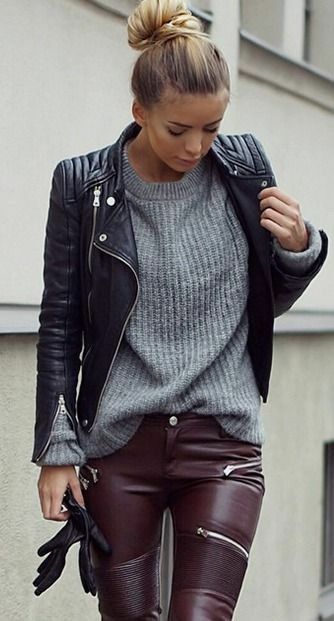 If you are a beginner and would like something very simple, choose a biker jacket and pair it with a sweater or a blouse and a pair of jeans. On the other hand, you can get a bit crazy and choose a colorful, pinned or embroidered jacket to create a bold look. Whichever direction you decide to go, make sure to rock your outfit with confidence! Starting off our list with a beautiful, embroidered leather jacket with pearl detailing, this outfit is simply stunning! While the pearls make the biker jacket more feminine, the styling of it is very edgy and minimal. We also love the luxurious pencil skirt and the snakeskin clutch! Because of its sturdy, textured material, leather can be easily mixed with almost any other fabric to create an interesting look. We love the contrast between the silver metallic fabric and the black leather, not to mention the fact that it’s a jumpsuit that looks casual and elegant at the same time. 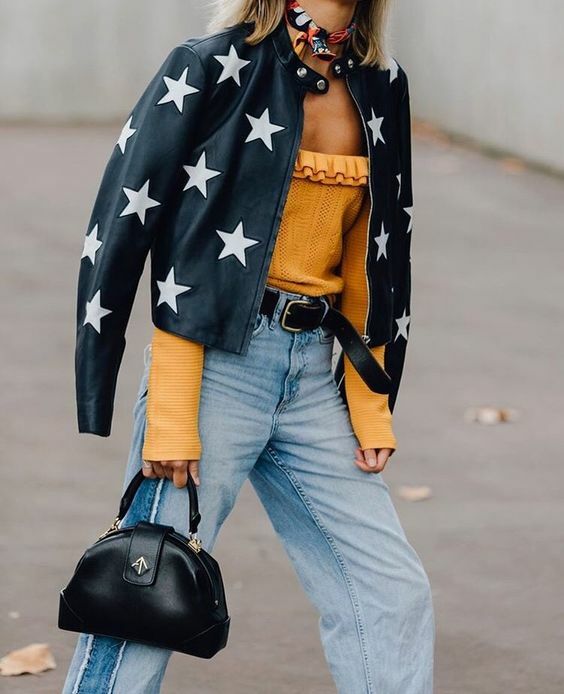 Besides the classic, black leather jackets, we are also in love with colored ones, and the styling with this caramel leather jacket is absolutely perfect. This outfit features a warm undertoned, classic Chloé bag and a pleated midi skirt, and to make things even more interesting, the model rocks it with plain white sneakers, which gives the whole look an urban edge. This look definitely plays with various different styles, and because of the blend of casual and luxurious elements, this outfit is a winner for basically any occasion. If the leather jacket wasn’t casual enough for a green, sequin pencil skirt, the model decided to rock it with a distressed, dark denim shirt. Who says leopard print can be a part of a casual, comfy outfit? This look features a cozy, oversized sweater with a leopard scarf, ripped jeans and a sturdy leather jacket, and we can’t imagine anything more perfect for a winter school day than this outfit. To spice it up, choose a red or dark brown lipstick! 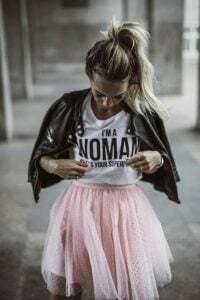 A pleated metallic maxi skirt, a casual black and white blouse and a leather jacket…although you might not think they go well together, this outfit perfectly makes sense. Regardless of the different materials, styles and colors, it looks very fashion forward without being too loud or over the top. We love the matching color of the T-shirt and the hat, especially with a little black detail. With the structured design of the leather jacket and the masculine hat, the pink looks fresh and modern. This outfit is perfect for any occasion from a casual school day to a brunch date. This all-yellow outfit matched with the classic black leather jacket is the perfect vintage inspired outfit. The turtleneck sweater, the wool, button-up skirt and the leopard print glasses reminds us of the 90’s, but if you want to add a modern twist to it, add a few accessories to the look. 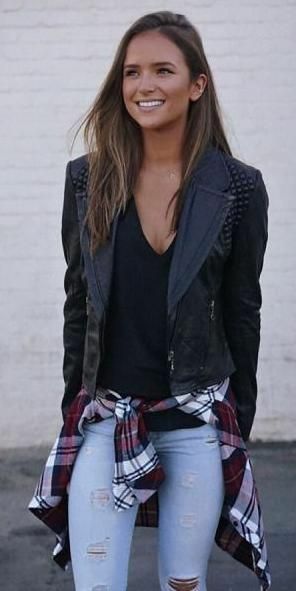 This look definitely has a grungy vibe with the ripped jeans, matte black studs and classic flannel shirt wrapped around the waist. 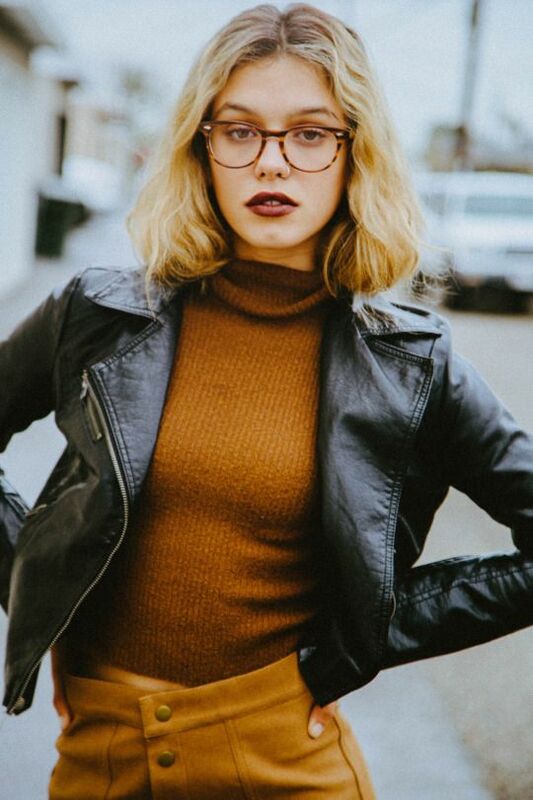 If you would like to experiment with grunge style but not sure what to wear, this is the most perfect look to start with. A green midi skirt is always a feminine, daring choice, and there is nothing better to match it with than a studded leather jacket. This outfit is completed with a pair of leopard heels, sunglasses and a black tote bag. An all-black outfit is always a great fashion go-to, both for casual and formal occasions. This outfit features a beautiful maxi skirt and black glitter top with a black, biker leather jacket. Besides the clothing items, the accessories and details are on point as well, such as the beautiful messy bun and the patterned clutch. You can easily mix and match different leather clothing items without being too sultry or over the top. 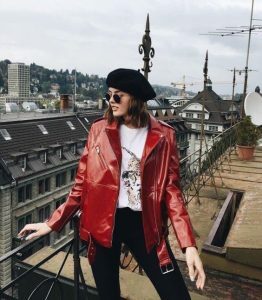 To make the outfit interesting and edgy, mix leather in different colors and get inspired by this outfit, which features burgundy leather pants and a classic, black leather jacket. We also love the gray, chunky knit sweater. While leather is known as an edgy material, this outfit definitely shows its haute couture, feminine side. We love everything in this outfit from the beautiful lilac lace and lace up top to the black bead and pearl embellished leather jacket. 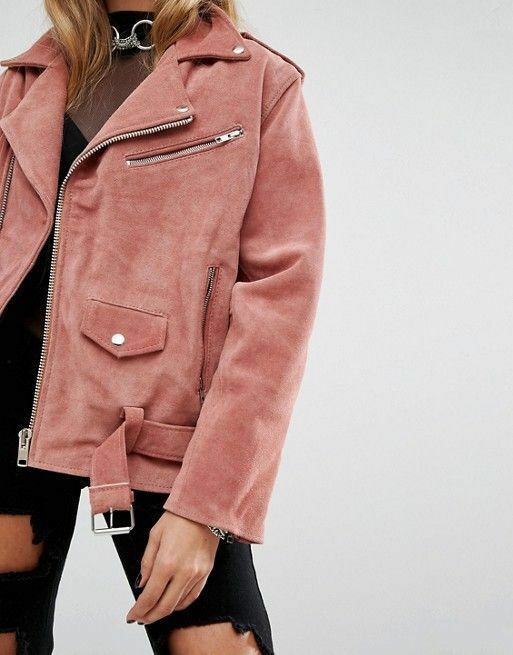 A toned down version of leather jackets and suede leather pieces, and with its pink shade and slightly oversized design, this jacket is girly and cool at the same time. Besides the jacket itself, the styling is amazing as well with the choker and the mesh top. This look is so gorgeous! With the mesh, cut-out crop top, the classic black leather jacket and the midi pencil skirt create a creative outfit that plays with sultry and formal elements. Another thing we adore about this outfit is the styling with the ombré, wavy bob and the gold accessories. 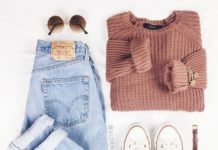 This outfit has a great, casual and comfy vibe, which is perfect if you just want to feel comfortable, yet stylish. Besides the clothing pieces (the black leather jacket, the white sneakers, the relaxed gray pants and tank top), the color palette of black, white and gray create a minimalist, monochrome vibe. Stripes, leather and a midi length always look great together, and this look proves exactly that! While it is a simple, black and white outfit, the different fabrics and the textured midi skirt create a very fashion forward look. We would love to match this outfit with a pastel, neon or red clutch and a bold makeup look. This outfit is so interesting and stylish! 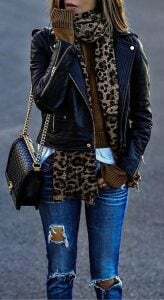 The textured black leather jacket looks great in contrast with the long, black and white mesh polka dot top, and although it is an experimental look, the simple pair of jeans tone it down and make it a great street style outfit. 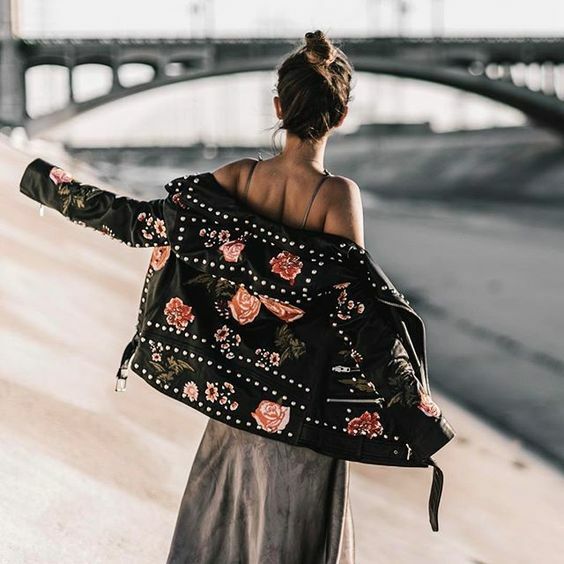 If the embroidery on this jacket with the floral details and studs wasn’t breathtaking enough, this look will definitely win you over with the satin slip dress. The contrast of the cool and sophisticated elements makes this street style outfit one of our favorites from the list. This outfit just couldn’t be more perfect: the oversized, red patent leather jacket with the white tiger T-shirt and the black accessories creates a boho chic, urban look that you can rock to any event. Accessorize it with silver jewelry and a red lipstick! This leather jacket is such a statement piece, even by itself, but with the mustard off-shoulder top and simple jeans, it’s an amazing look! The oversized design makes the jacket even more edgy and cool. This jacket would also look great with a red or pastel blue dress. 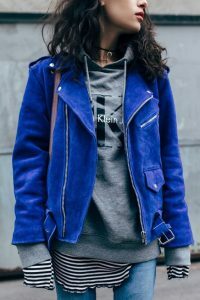 This biker jacket has a gorgeous, vibrant blue suede design – and because of its bold color, you can basically style it with everything from white chiffon dresses to grey sweaters and green jumpsuits. The mix of black, yellow, blue and red as a main accent is absolute perfection! With the lips, the oversized jacket and the T-shirt dress, this outfit screams urban, edgy and pop art. If you want to emphasize this style, even more, rock it with black boots and a pair of crazy sunglasses. This bohemian look features a yellow, fringed biker leather jacket with a pair of shorts and a cute, white top. If you love creating contrast with your looks and mixing different fabrics, fall in love with this look! The patent leather looks great with the white, mesh top. We also love how this outfit features only black and white. The olive suede leather jacket with the shoulder pads have a masculine, military vibe that we absolutely love. The dust chiffon maxi skirt makes the whole look really interesting, and with the gray T-shirt, it’s not too overwhelming. This outfit is probably the most fun and playful look from the list. The mix of the pink, full tulle skirt and the printed T-shirt gives us major Carrie Bradshaw vibes, and besides the baby pink, we could also imagine this look with a pastel blue or white skirt. 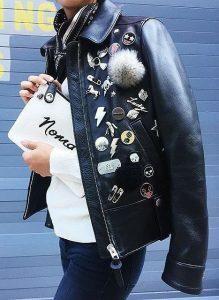 The metallic and fur pins, the printed white clutch and the biker jacket style is a great modern take on the vintage rock & roll style, especially if paired with ripped jeans or a denim jacket. 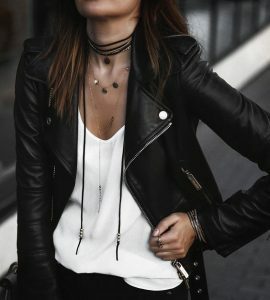 The white leather jacket with the simple white T-shirt is a great casual go-to, whether you want to show off your tan or just love to rock monochrome, white outfits. If you’d like to keep the all-white theme, pair it with white jeans or a patent leather white skirt, or simply wear it with classic jeans. 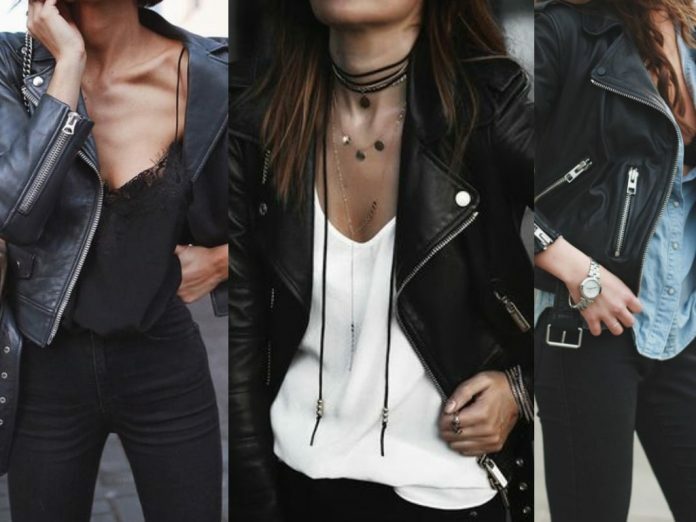 Leather jackets don’t have to be fitted and slim – you can also rock a super warm, oversized leather jacket and look stylish! This look features an oversized, leather and wool jacket with a simple Paisley print dress.